Me Before You is a bit of a phenomenon; the book was highly successful upon release and now that a movie is in the makes, featuring Emilia Clarke, everyone seems to know about this book. What better reason to pick it up too? When I started reading this book, I thought I wouldn't like it. It starts off with a girl, Lou, in a small town, who is just a little bit different than everyone else but still conventionally attractive, who meets a guy, Will, who is in a dark place and doesn't want to connect to people. I know about ten books right away that could fit that summary and they all end in the same way: the guy loves the girl for her quirkiness, the girl brings out the good side of the guy and they ride off into the sunset. Now I assume Jojo Moyes was aware of those books and deliberately decided to play with our hearts and turn it all around so that no one can predict what will happen in this story. While the start might read as a cliché, the plot soon takes so many twists and turns that you have to be convinced that this book is not a normal romance story. It's unlike anything I've ever read. The thing I loved most about the book is that romance is used to offset personal changes in everyone. Love does not make everything okay. It does not make your whole life perfect and wonderful. Love is a beautiful addition and motivation to enhance a life. Lou never becomes the lovestruck girl that only focuses on a man. She constantly grows and matures and uses the love she feels for different people (Patrick, Will, her parents, her sister), to become the best version of herself she can be. Now I don't know anything about being bound to a wheelchair, but Will read so truthfully to me. A strong, independent man suddenly stuck for the rest of his life without the use of his legs or arms must go to a very dark place. The characterisation of Will is perfect; he doesn't get cheered up by a sunny or a particular painless day. He knows his life will never change and he is angry about that. Like anyone else would be. Of course, a big part of Will's story line is his desire to end his own life. He has tried to commit suicide and now he wants to go to Switzerland to end his life in a dignified way. 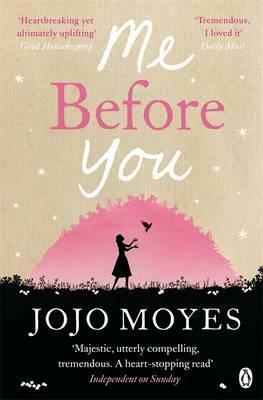 This is never an easy topic to handle in a book and I must say that Jojo Moyes handles the topic in a respectful, but also realistic way. Will wants to end his life and pretty soon, the reader figures out that nothing can change his mind. Love can't change his mind. Just like with Lou, love makes him a better person, but it does not take away who he is. Or the fact that he can't walk or move. Or that he'll slowly waste away more and more. It's incredibly painful and heartbreaking to read how unhappy Will is and together with Lou, the reader realizes that nothing will ever make him truly happy again. But it's also beautifully realistic. So even though this book started off slow, it became so amazing in the end. The characters are realistic, painfully so at times, and there is no way that anyone can read this and not want to help Lou convince Will to live. To stay. To try. And that's a beautiful journey to make with a book, so it's a five out of five stars in my opinion.